An online guide designed to inform students about Interlibrary Loan services, to assist patrons in submitting ILL requests, and more. If you're a currently enrolled LaGrange College student, or member of the faculty or staff, you can request books and articles from other libraries on interlibrary loan (ILL). You can submit ILL requests directly by EMAIL to Arthur Robinson, the ILL librarian. You can paste citations directly from databases. If you have questions about ILL, check the FAQs Page; if it doesn't answer your questions, please EMAIL Arthur Robinson. Lewis Library's interlibrary loan policy is available HERE. Paper ILL request forms are available in person at the Library. 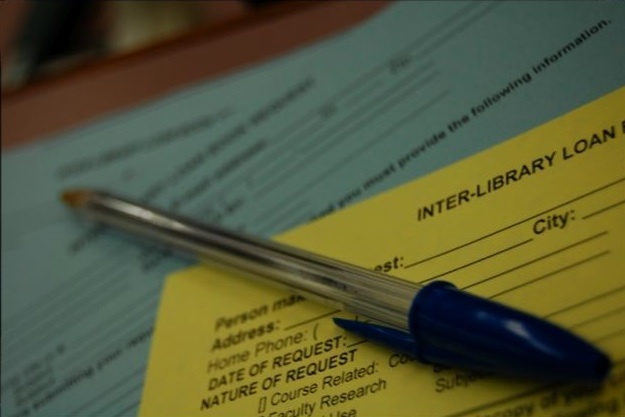 Visit the Lewis Library Reference Desk to fill out a physical request form. Make sure the library doesn't already have the article or book! Before requesting an item via ILL, please be sure to check the library's catalog to verify that we do not have the item you're searching for.